Published in "The Key Finder"
Woodward' s birthday began when President Cleveland signed the proclamation opening the Cherokee Strip to white settlement on Sept. 16, 1893. At high noon on this day, there were but a handful of people including a few employed in government service, the Santa Fe agent and his clerks, and the railroad "eating house", people who could give their address as Woodward, "N" County, Oklahoma Territory. By one o'clock on this same day, Woodward sprang up as if by magic into a town of 1200 people. In the turmoil of those early hours, the confusion, the heat, the toil and physical exhaustion, our horizons were doubtless limited to the getting of food, clothing and shelter. Even before the sun had set, men were building houses, moving in goods, surveying lands, while an extra force of land office clerks were busy with claim filings. A county government was in operation attempting to see to the peace and welfare of the people generally; - a probate judge, sheriff, treasurer, clerk, superintendent of schools, surveyor, and three commissioners. Even a newspaper, the "Advocate" came out with its first issue on Sept. 16, 1893. On the second train of many that arrived that day, came Mrs. Mattie J. Collins. She was met by Ben Keyes, who later became an important figure in the general development of Woodward. Mr. Keyes asked Mrs. Collins out to dinner. Dinner consisted of a large sandwich wrapped in brown paper. Mrs. Collins got hold of a horizon right there. On land that is now occupied by the F & W Shoe Store (1968), two parallel trenches were dug, fires were laid in the trenches, iron kettles were placed on the fires, and into one kettle went beans, into another tomatoes, then corn, then meat stew, and so on. Before suppertime on that day, Woodward's first first—class eating establishment was in operation. Not long after this, on the same location, Mrs. Collins built the Central Hotel, which for many years was a landmark for clean management and good food. And so, as Woodward went to bed that night—and I am sure many slept under the stars—there were dreams of far-off horizons, of homes, schools, churches, and all that makes a city fair, yes, much fairer than the homes they had left. Horizons which they were to make realities. In the chaotic weeks and months that followed, progress was made and also difficulties arose. One of the first of these was the appearance of two Woodwards. The original town plan placed the city square and business district on land now occupied by the Court House and Memorial Hospital. The Santa Fe had located its station adjacent to this property. In the meantime, property at the east end of what is now Main Street, was more easily accessible and the principal development began in this location. After some feuding and argument, the west came a little to the east, the east moved a little to the west, the Santa Fe moved to its present location, and all were united again. Another, and more deeply-rooted problem took longer to solve. As early as the 1860' s, with the growth of the cattle industry in Texas and the lack of railroads, cattle were driven across Oklahoma to Dodge City and Abilene, Kansas. In 1876, the first herd of Texas cattle came up by a new route, which became known as the Western Trail, leading straight through Woodward to Dodge City. By 1879, this new trail was taking almost half the cattle coming up from the South. Now, from the north and northeast came the farmers from Missouri, Iowa, Illinois, driving to the fertile prairies with very different notions in their heads of how the land was to be used. A head-on collision of widely-differing horizons was inevitable. The conservative farmer and his crops met the free-wheeling cattleman and his herds. A long and bitter struggle ensued--lawsuits, litigations, even shootings and killings. Eventually, peace was restored. There was room for all, and to this day agriculture and live- stock together form the basis of our economy. While the basic needs of food, clothing, and shelter were being met, and the sod-houses, the box-houses and temporary shanties were going up on the farms, the people were eager and impatient to get on with "the finer things of life." In retrospect, the speed with which they accomplished so much, specially in view of their limited resources, is almost unbelievable, In the winter of 1893-94, a school was established. Alex Geismar entered this school the next year, on Mar. 25, 1894, age 6 years. It was held in the Delta Hotel at 5th and Main, with Mr. J. F. Ballard as principal. All grades met in one room and there were not many pupils, the older children being needed at home. One year later the old Opera House at 8th and Texas had been partitioned into rooms for the school and the playground was the present city park. In 1896, a four-room building was erected on the northwest corner of the Civic Center property, and this school building with later additions was used for several years. Church groups began meeting in homes, in court rooms, in lodge halls, in any available place until the time should come when they could have buildings of their own. Ministers and mission-preachers came across the roadleas prairies on horseback, on the cow-catchers of the trains, on the tongues of covered wagons, they walked from town to town to give spiritual leadership to their flocks. The oldest church edifice is St. John's Episcopal Church which was built as an army chapel at Ft. Supply and was moved to Woodward in 1894. The first service was held on June 29, 1894, and was conducted by an army chaplain. The church, first located at 7th and Main, was moved to its present location on April 17, 1901. Early records indicate Episcopal services were held two Sundays each month. On alternate Sundays and through the week the church opened its doors to other denominations for their use. The next church to be formally organized was the First Methodist on Oct. 26, 1895, the first building being dedicated in 1900 on the present location. The Methodist is the only one of the earliest churches to remain on its original site. The third church in Woodward was the First Baptist, Jan.18, 1896. The first church was located on Texas Ave., a few lots west of 11th St., and the building was begun in 1898. As soon as it was completed, it was opened to other churches who were without church houses. First Presbyterian was the fourth church to be organized on Sept. 24, 1901, having met prior to this time in the home of Mr. and Mrs. C. E. Sharp. Their first building was at the northwest corner of 11th and Oklahoma. A year later came the First Christian church on Sept. 28, 1902, and the first building was located on the northeast corner of 13th and Main. Next came Trinity Lutheran on June 28, 1903, followed by the Methodist Church South later that same year. The eighth church to be established was St. Peter's Catholic. First Mass was celebrated on June 19, 1905, in a church located at the northwest corner of 13th and Main. These eight churches remained the pattern for several years, and represented a significant milestone in the quest for a better town. True, other and less desirable horizons were much in evidence during the early and somewhat rough days of our city. The thirteen saloons on Main Street, frequent brawls, and other signs of "vice and wickedness" were not lacking. But the real leadership was not to be found in the thirteen saloons, for which we are ever grateful. The churches and the hard-working, high-minded men and women who made them possible provided the leaders, believing with the Psalmist: "Except the Lord build the house, they labor in vain that built it. Except the Lord keep the city, the watchman waketh but in vain" (Psalms 127). During these years the officers of law and order were not idle. On the property now Williams-Baker Used Car Lot, there soon appeared a number of small frame buildings each one housing a county officer--the judge in one, the sheriff in another, and so on. As early as July 24, 1901, the contract was let for the erection of the County Court House at this same location. The Court House was an imposing structure and dominated the town for many years. Of red brick faced with white stone, it rose two stories, with very high- ceilinged rooms and a cupola on top. It served the county for 36 years. In the early summer of 1899, the business men decided to have a real bang-up Fourth of July celebration, and went up and down the streets collecting money to defray expenses. A few weeks later they turned the project over to Caterie Club. Now the ladies of Caterie were something to reckon with-- they had ideas. Caterie was organized in 1897, the first federated club in Woodward and the second in Oklahoma Territory They wanted a Public Library in Woodward. So, for the Fourth of July, they decided to sell lemonade and ice cream and lots of it. They also made the occasion a success with all-day picnic, speeches, bands, and flags, and came out with $200. With this, the Woodward Public Library was organized on July 27, 1899. Funds from membership subscriptions were added, each member donated $10, books, time, and much hard work. The Library was housed for a while in one of the Court House small frame buildings, blistering hot in summer, and freezing cold in winter, yet the ladies faithfully took turns keeping it open in the afternoons. All work was voluntary. The Library was later moved to the Library Room of the old High School Building where it stayed until it was moved to the present location. In 1903, Caterie turned the Library to the City. The books were valued at $1,000. The city paid Caterie $190, the sum originally donated by the members. Early Woodward could not have survived without the dedicated women who contributed unsparingly to every forward-looking project. When we remember these were the days of washboard and tub, the broom, the icebox, the coal- oil cook stove and coal furnace, very few cars--you walked and you walked not on sidewalks or paved streets - their heroic effort and far-reaching accomplishments shoud be etched in gold with precious stones. Behind every church building, were countless rummage sales, food sales, chicken pie suppers, bazarres, concession stands at picnics, fairs, and so on. Money was hard to come by but the ladies got their share of what there was to further the causes they believed in. Later through their organizations their impact on the community was far greater. After Caterie, came Lieder Kranz, organized in 1909. Lieder Kranz, later the Woodward Music Club, was truly an outstanding addition to our community as well as to all of Northwest Oklahoma. With a large membership representing all groups in the city, it was able to create and bring to Wood-. ward not only music of high quality, but also a variety of cultural advantages and experiences whose influence can never be measured. Even in these days of TV, the Woodward Music Club would compare very favorably in the type of musical and artistic performances they presneted. P.E.O. and Sorosis were organized in 1914, and here again women convinced of' the value of selfimprovement as well as civic endeavor widened our horizons and made us realize that man does not live by bread alone. Isolation was the curse that held us back. The heart-breaking history of the years of struggle for roads went on and on. Every avenue was tried again and again. Delegations went north, south, east and west. Every conceivable effort was made for east-west railroads. All to no avail. Farm-to-market roads, , the life-blood of our economy, were non-existent. The minutes of the Chamber of Commerce (organized as the Commercial Club in 1916) are full of these accounts all through the years. In the early days, work gangs of Woodward businessmen went out on road construction, and slowly, but far too slowly, progress began. It was not until 1935-36 that Highways 183 and 270 finally came through. Typical of the discouraging picture, is a farm-to-market road that was sorely needed in 1915 in the Haskell area, west of Woodward. 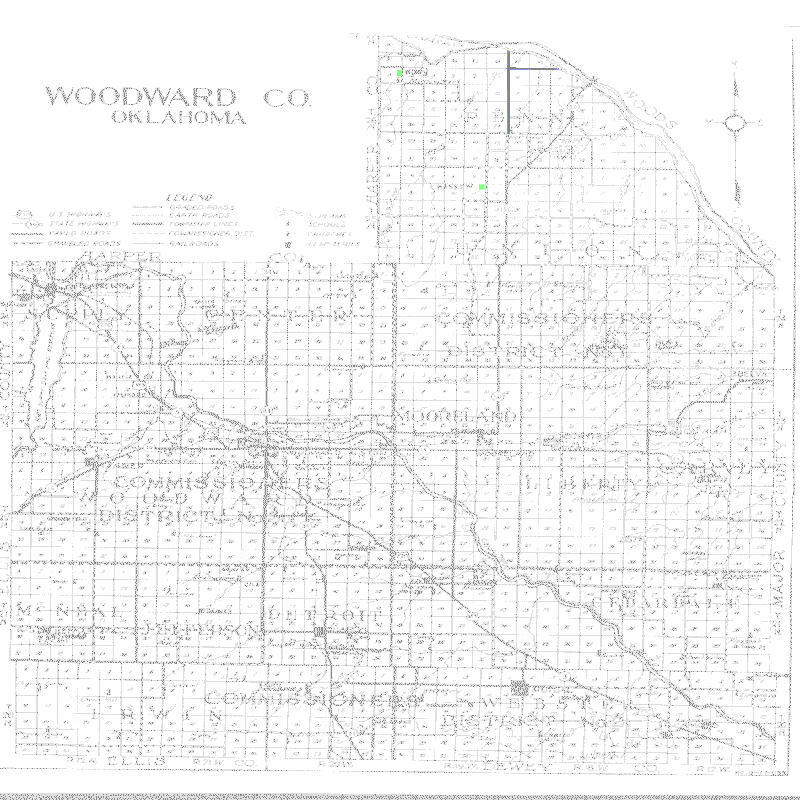 Just a few weeks ago, on Oct. 11; 50 years later, a delegation of Woodward and Western Texas men met again with the Highway Commission in Oklahoma City to try for a road running west in the old Haskell area. From 1912 to the early twenties, our horizons were lifted quite literally in the simultaneous construction of several public buildings. . The school system was considerably expanded with the building of the first two-story brick (old high school) and of the three elementary schoo1s - East, West and North Wards. In January, 1916, the city began negotiations with the Carnagie Foundation whereby the city would support and maintain a library and the Foundation would construct the building. The Foundation contributed $10,000 and the new. Library was dedicated in May, 1917. The First Baptist Church erected its new building in 1917 on the present location. First Christian Church moved to its present location in 1917 and began construction on the first section of the present building. The bond issue for City Hall and Auditorium was carried in 1916. The Federal Building (old Post Office) was begun in 1917. In 1919, a sizeable bond issue was passed for the improvement of the water and light plants. Crystal Beach and Park came along in the early 1920' s. A new First Methodist Church and a new First Presbyterian Church were built a few years later. And so, Woodward was well on its way, happy in its achievement, but never satisfied. Many noteworthy advances were made, but time will not permit a record of them all. Then came the dark days of the depression and the dustbowl. Surely, if ever there was a time when adversity tried men's souls this was it. It seemed, in those dark years, that everything for which we had struggled so hard was ruined and that Woodward was literally being blown away. But the people defied the elements, many left, but more stayed, sustained in the faith that "it would come back". With grit and determination they held on until the pastures were green again, and there was money in the bank. Not all was blown away. The urge to do something, even with limited resources, was still there. In 1930, when J. F. Quisenberry began his work as County Superintendent of Schools, he was appalled at the lack of opportunity for the rural school children - a part of our community which had been almost forgotten. In the drudgery and poverty of their surroundings, there was little, if anything, to inspire them to look to happier horizons. Isolation had been cruel, and it still existed on the many small farms. Working with the city schools, Mr. Quisenberry organized track teams and other athletic contests for the boys. Great indeed were the occasions when the rural teams came to town, competing against each other and the city school boys: - greater still when the country boys won prizes and medals. A relatively small thing, but it helped tremendously. There was also the school chorus. In each community was found someone who could sing and get others to sing. The entire school was organized into a chorus, schools were combined for rehearsal, and plans made for a united concert in Convention Hall. The idea caught on, everyone helped. Lela Belle Young and her friends went out into the byways gathering huge loads of grasses and wild flowers, dyed them brilliant colors and decorated Convention Hall. Against this beautiful back--ground, the children sang-(not jingles and familiar tunes, but real music)-- to a packed house. Another project that meant much to the children:--a collection of magazines was started in the basement of the Court House. Regularly these were loaded into the old Model T and taken out to the farm houses and schools, A county-wide-city--wide tree-planting program was inaugurated. Other similar projects were undertaken resulting in hope, ambition and opportunity, replacing monotony and despair for these boys and girls. Gradually, but surely, the old Woodward came back and prosperity returned. The spirit of looking forward to better days is illustrated in the elaborate post-war planning that began in 1944. Realizing that a new era was dawning, and that great demands would be made in every community, the Chamber of Commerce initiated a comprehensive study of needs and resources of our area. Ministers, school cfficials, doctors, businessmen, and others, spent much time on this study. Long, detailed reports are on file showing the results of their efforts. Long-range and short-range planning, immediate and ultimate goals, and a broad vision of the future were included. Some of these were carried out following the close of the War, and others were in process, when there was an abrupt interruption. It came the night of April 9, 1947,-The Tornado. "Dedicated to serve humanity - With God's help." Kids Incorporated, was another achievement resulting partly from the tornado. Now, it is so vital a part of our community that we could scarcely get along without it. The past fifteen years have, on the whole, been prosperous years for Woodward. Residential expansion has extended our city in every direction. Beautful houses, lawns, and gardens exist in every section of the city. Our churches, of which there are now 23 different denominations, have rebuilt, added educational buildings, and even the smaller groups worship in beautiful, inspiring surroundings. Businesses have increased annually, and Main Street has been in almost a continual state of re-building, re-modeling, and general face-lifting. Our professional men are housed in attractive, modern offices. The Civic Center, Library addition, the long-needed bridge over the North Canadian are but a few of our recent advances. Our school system is a source of pride. Woodward has always believed in and strongly supported our schools. Our art and cultural center, The historical Museum, originally promoted by Dr. John L. Day and made possible by Dr. and Mrs. C. E. Williams, attracts visitors from far and near. The Fair and livestock Building provides housing for livestock shows and the County Fair.